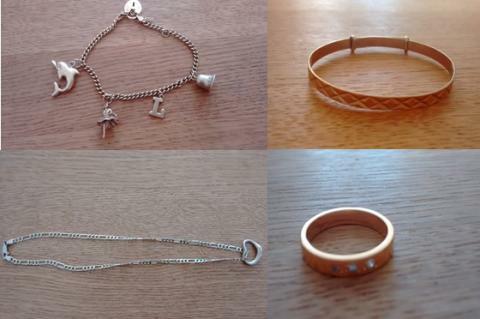 We are looking to return the items, which have significant sentimental value, to their rightful owner after they were stolen in a burglary. The burglary took place between 4.30pm on Friday 14 December and 5pm on Saturday 15 December, at a house on Denbigh Close in Eastleigh. A gold ring with three diamonds in the band made especially for the victim from her grandfather’s wedding ring, which was melted down after he died. A 9 carat gold bracelet with charms attached including a heart padlock, a dolphin, a ballerina, a small bell, and the letter ‘L’. A black leather Pandora bracelet with a safety chain and six silver charms including a frog, two owls, a heart, a butterfly, a ball with flowers and stones, and a silver bead engraved with the words ‘Love U Ms Smiley’. A 9 carat gold christening bangle with a diamond/lattice engraved print. Two Pandora Christmas charms kept in a small box. Both are silver – one is a Christmas stocking and the other is round with red enamel to look like Santa. A gold necklace with a heart pendant. If you witnessed this burglary, have any information, or have been offered sale of items matching this description then please call us on 101 quoting 44180466571.